Got some pretty good shopping trips in this weekend. Went into Shoppers Drug Mart to get a couple things and use some coupons. Both things I went in for had the sale tags on the wrong items. Whoever did the pricing must of been half asleep! Not that I am complaining, I got even better deals! While I was in Save on Foods I also found Aylmer Accents Tomatoes on sale for $1.00 each (not in photo or price count) – was happy to see those, I didn’t have any coupons but I always miss out when Wal-Mart has them on for $1.00 – they always sell out right away. I also got buy one get one free frozen ribs! Was a good day and looking forward to making a nice dinner. 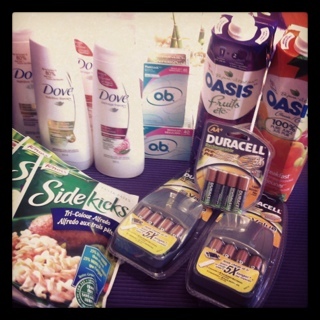 This entry was posted in canadian coupons, coupon stacking, coupons, deals, food, free, price error, save on foods and tagged canadian coupons, coupon stacking, free, price error, save on foods on November 27, 2011 by Courtnie.